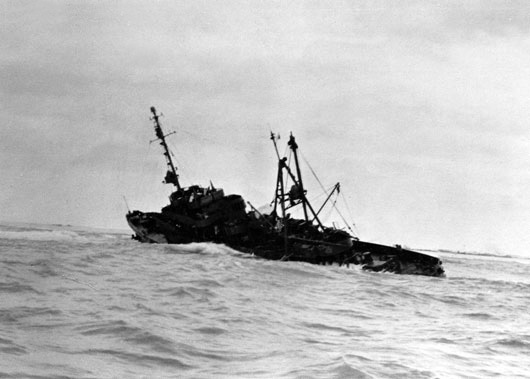 The Submarine Rescue Ship USS Macaw (ASR-11) sank while attempting to rescue USS Flier (SS-250), which had run aground at Midway. Although a total of 115 officers and men survived the sinking, five men were lost, including the Commanding Officer, Paul Willits Burton. In addition, three men stationed at Midway - Howard Eugene Daugherty, LeRoy Benjamin Lehmbecker, and Ernest David Samed - drowned while attempting to rescue Macaw's crew. Please see this fine page on USS Macaw.